I spoke with Patrick Hopkins Jr. who is the creative force behind a recent addition to Philly’s limited pickling scene*. His story is similar to that of many start-ups in the local food scene. 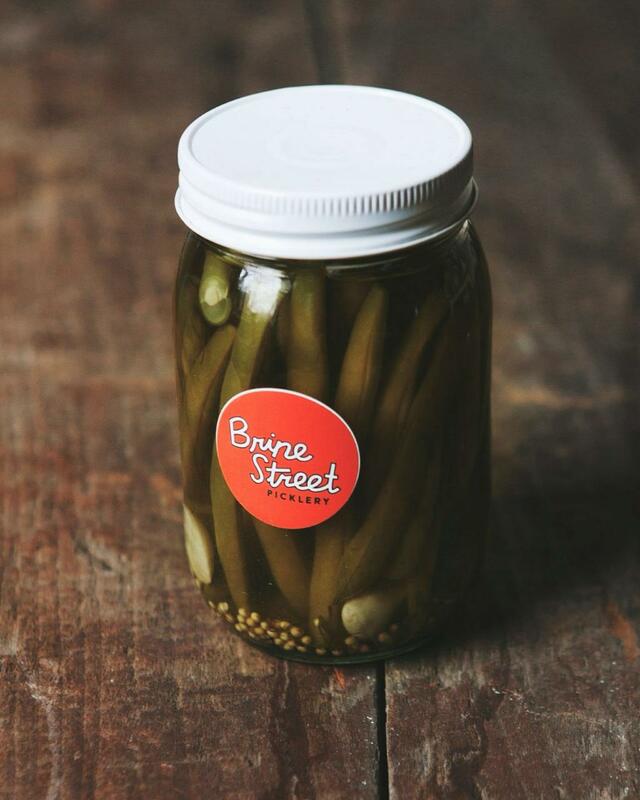 What made you start a pickling business? I worked as a cook at Iron Hill Brewery in Maple Shade for a little less than a year. Before that, the bar, restaurant scene. I always cooked in my spare time. The story with the pickles is that me and my girlfriend went down to New Orleans for jazz fest about four years ago. And we’re walking outside of the camp ground where jazz fest is happening and I noticed this one bar where everyone is partying in the street. Brass bands are playing. Everyone is drinking Bloody Marys at 9 o’clock at night. And they all had these pickled green beans in them. It got to the point where we’re ordering the Bloodies just to eat the beans. I went up to the dude and asked what’s in them and he pretty much just told me what he does. I brought it back to Philly and just started tinkering around. Ever since then, I’ve been giving them out as gifts and bringing them to parties and then enough people liked them that I thought I should try to sell these things. And that’s where we’re kind of at now. Still building it. It’s word of mouth, spreading it around. People are more helpful than I would have expected, and friendly, in the local artisanal scene. When you’re saying helpful, what do you mean? We’ve reached out to some other like minded companies who we knew through friends of friends and just asked them some basic information in terms of FDA stuff, labeling stuff. Even in terms of getting our inventory and all our numbers on point. It’s kind of refreshing to see just normal people willing to help out. Who are some people you reached out to? One guy from Hank Sauce, a hot sauce company based out in Sea Isle. Also a friend, Brendan [Cawley] from Righteous Felon Jerky. I just walk into bars and I ask the bartender, where do you get your pickles from. Do you make your accoutrement for your Bloody Mary or do you source that. And that’s how we’re starting to build our rolodex. We’re kind of scaling up right now, building the name. We’re looking to ramp things up in June. So, you’re just selling online right now? Not even that. We have a landing page. A Facebook and an Instragam [they’re keeping it lo-key with product notices on social media]. There’s an email on the landing page. You can put your order in that way. We actually sold out of all of our regular cucumber pickles–the spears and the chips. We also make a hot pepper hoagie relish. We also sold out of all of that around Christmas time because we made a bunch in September/October and I wasn’t really sure that we were going to do direct to consumer sales and a bunch of our partners said you should just test it out and we ended up selling it out. We just started doing this, I would say September…August. We’re approaching different vendors. We have a couple people–nothing set in stone–but markets in the city and some in Reading Terminal. Our hopes would be to get in five or six markets [to start]. And we’re trying to hook up with some farm shares. Philly Foodworks is one. We know the guy there–over in Northeast Philly. They already have that built in–the add-ons to the food shares. We’re just trying to sell a good product at a reasonable price. That’s why I started making these things. Because you go into some of these stores and they’re charging like $12 for a jar of [gourmet] pickles. I’m like, I know it doesn’t cost all that much to make that. So that’s where all this came from. Our price point is somewhere between seven and eight bucks for a 16oz jar. This is a standard size. For any of our competitors, it’s either this for either $8-10, or it’s a little bit bigger, say like a 24oz jar, for $10-13. The other reason we wanted to do a smaller jar, is because if you only wanted one pickle–I’ve had a beef with these larger jars–then you have to take up more real estate in your fridge. I think that people would rather pay less for something they would only eat every once in awhile. 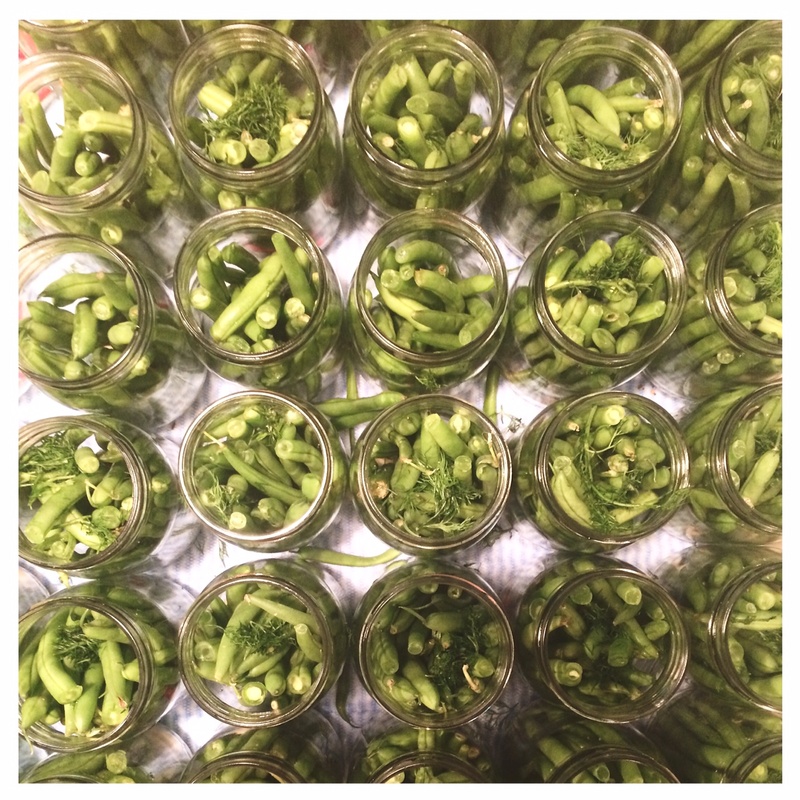 Prepping spicy pickled green beans. Courtesy BSP. When did you work at Iron Hill? It’s about three years ago. I was there a little less than a year. I was working the line after starting out as prep. I was still working my regular job (in insurance). I would go in there every weekend, Saturday, Sunday, 8a.m.-4pm. Then they moved me up to the line so I was doing garde manger and fry station station–all basic appetizer stuff. Then it got to the point where I was working 75 hour weeks and the restaurant paycheck was not glorious by any means. So, I stopped doing that and just stuck with the regular job.